Pope Francis will declare Pope Paul VI and Archbishop Oscar Romero saints of the universal church in a ceremony in the Vatican on Oct. 14 during the synod for bishops on young people, he announced today at a public consistory at the Vatican. They will be canonized along with four other blessed: two Italian diocesan priests, Francesco Spinelli and Vincenzo Romano, and a German and Spanish nun, Maria Caterina Kasper and Nazaria Ignazia di Santa Teresa di Gesu, both of whom founded institutes for women religious. 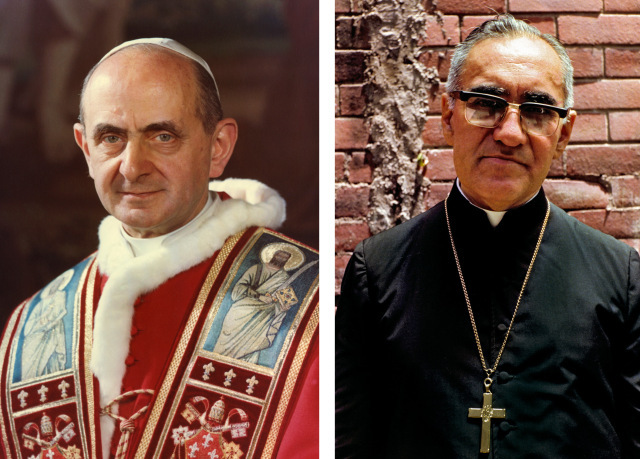 The news that Paul VI and Oscar Romero will be declared saints together is highly significant because they were close to each other in life, and both are much revered by Pope Francis. It is also fitting that they will both be canonized during the synod of bishops on young people. Paul VI guided and brought the Second Vatican Council (1962-65) to a conclusion and subsequently established the Synod of Bishops at its request. Archbishop Romero, for his part, is an inspiring example not only for bishops but also for young people of how to live the teachings of that council with courage through commitment to justice, peace and to the poor, even to the point of martyrdom. It is appropriate, moreover, that they will be declared saints on the same day because as pope from 1963 to 1978, Paul VI was particularly attentive to Latin America. After issuing his landmark encyclical “Populorum Progressio” in March 1967, he traveled to Colombia to participate in the watershed plenary meeting of CELAM, the Conference of Latin American Bishops Conferences, which was held in Medellin, Colombia, in Aug-Sept 1968 to implement the teaching of the Second Vatican Council. That assembly affirmed the preferential option for the poor as an integral part of the church’s evangelizing mission on this continent where almost half of the world’s Catholics live. Archbishop Romero’s ministry was inspired by the teachings of Vatican II, Paul VI and the conclusions of the CELAM assembly in Medellin, which led him to strongly denounce the violence, torture and poverty in his homeland. He appealed to Salvadoran soldiers not to shoot their fellow citizens, their brothers. “Archbishop Romero is a martyr of the church of the Second Vatican Council”; in killing him, “they wanted to hit the church that flowed from the Second Vatican Council,” Archbishop Vincenzo Paglia, the postulator of his cause for beatification declared at a Vatican press briefing on Feb. 4, on the eve of his beatification. He added that “his death—as is clearly shown from a careful examination of the documentation—was caused not from simple political motives, but from a hatred of the faith kneaded with the charity that would not remain silent in the face of the injustices that implacably and cruelly struck down the poor and their defenders.” Indeed, “his death at the altar” on March 24, 1980, “had a symbolism that sounded like a terrible warning to anyone who wished to follow on that path,” Archbishop Paglia stated. Paul VI supported Romero, so much so that the archbishop recalled with emotion that during their last encounter in the Vatican “he held my right hand for a long time.” The pope then told Romero that he understood “the difficult work” that he was engaged in, “which could be misunderstood” and said it required patience and courage. Archbishop Romero’s work was not only misunderstood in El Salvador, but also in the Vatican where the opposition to the cause of his canonization, which opened in 1997, encountered numerous obstacles, including from some Latin American prelates including the two Colombian cardinals Dario Castrillon Hoyos (whose funeral takes place today) and Alfonso Lopez Trujillo (who died in 2008), as well as others, mainly from Europe, in the Roman Curia. The process was blocked until Francis became pope and, breaking new ground in the process for the causes of the saints, recognized him as a martyr who died for his work in defense of human rights, justice and peace. Francis opened the path for the canonization of the martyred archbishop and the Italian pope on March 6, when he authorized the promulgation of the decrees that recognize miracles attributed to both servants of God, after the commission of cardinals and bishops of the Congregation for Saints voted unanimously in favor of the recognition of those miracles. The miracle attributed to the intercession of Paul VI related to the positive conclusion of a high-risk pregnancy with the birth of a healthy baby, while the one attributed to Archbishop Romero regarded the cure of a woman in danger of death after giving birth. Pope Francis beatified Paul VI at a ceremony in St. Peter’s Square on Oct. 19, 2014 while Cardinal Amato, prefect of the Congregation for the Causes of Saints, presided over the beatification ceremony for Archbishop Romero in San Salvador in May 2015. It is surely significant that Archbishop Romero’s beatification first, and now his canonization, comes when for the first time in history there is a Latin American pope on the See of Peter who wants “a poor church, for the poor.” Moreover, it is fitting that Pope Francis should canonize these two great church leaders since he sees his own ministry as being in continuity with both bishops whom he will soon declare saints of the universal church. It was during the pontificate of Paul VI that traditional Roman Catholicism was effectively destroyed and the catastrophe of Vatican II inflicted on the Church. In particular, his pontificate saw the promulgation and adoption of the novus ordo missae. That he should now be canonised marks another step in the Church's tragic journey away from her past purity and splendour. I was a youngster when the necessary reforms of Vatican II were implemented by Blessed Pope Paul VI. I do remember very vaguely when the priest had his back to the congregation celebrating Mass. Although on occasion some years ago (I'm now 56) I attended an approved Tridentine Mass in Philadelphia and was struck by the reverence of the diverse congregation (people of different ages, races, and most dressed with great decorum but others dressed casually because they may have been going to work later in the day), I prefer the Mass celebrated in the vernacular. However, I still follow some practices that I learned in my youth and at the time were mandatory. Although I believe it is perfectly acceptable to receive the Eucharist in the hand, bowing before receiving Jesus truly present in Holy Communion, I prefer receiving Holy Communion on the tongue. I admire Blessed Pope Paul VI for his courage as the author of Humane Vitae, which affirmed that married couples must remain open to new human life while practicing natural means of family planning. Although I was too young to recall the pope's address to the United Nations, it was admirable that he urged, "War, never again!" I also admire Blessed Archbishop Oscar Romero for his passion in advocating for the rights of the poor. He was a martyr who died while celebrating Mass. Archbishop Romero memorably observed, "As a Christian, I do not believe in death without ressurection. If they kill me, I will rise again in the Salvadoran people." I humbly join this holy man in affirming that death in this world can lead to eternal life, if we follow Jesus' commandment to love God and neighbor. May we all honor these two men. As a very imperfect Catholic , I will try to in simple ways defend the rights of all people, regardless of their faith. Among others, these include the poor, the elderly, the disabled, and the innocent unborn and their expectant mothers, especially those in difficult circumstances. Beautifully and lovingly expressed, Tim. All us Catholics could learn a lesson from the kindness and understanding...and deep faith...embedded in your words. Thank you. To rwdb1949@yahoo.co.uk - What a strange name, not sure it's really a name, more like a secret signal, maybe a code understood by those nourished by sour milk and rancid food from the occult? What is it? Long before the "catastrophe of Vatican II" as you called this great work of the Holy Spirit, didn't Jesus inflict on the Church violations of traditional Roman Catholicism by using the vernacular not Latin at the First Mass, also eating a big meat supper minutes before Communion, not wearing a lacey alb, or Romanesque Chasuble and that useless Maniple evolved from a Roman handkerchief? You mystify me and hopefully what I've said is more truthful, than uncharitable. Who are you? Your opening sentences are offensive merely, and deserve no more reply than that. As for the rest: if you accept the post-Vatican II innovations wholesale, logic commits you to the conclusion that the Church either taught error in the past or teaches it now; and, in that case, bang goes the idea of an infallible magisterium. I see, however, that this is a thoroughly 'novus ordo' thread and that there is no point in my trying to make any further contribution to it. Enjoy the rest of your day. To rwdb1949@yahoo.co.uk - I apologize that my opening sentences offended you, but must admit that the way you introduce yourself on line is a puzzle, which remains unexplained. Nothing Christian/Catholic is too sacred to mock as the following shows. An enemy of the Church mocking the Latin Words of Consecration, "Hoc est enim Corpus meum" with "Hoc est Pocus" now used as a magic formula well known makes me look with distrust to say the least, on any identification in appearance weird. If I have misjudged you, once again please accept my humble apologies. To answer your concerns: I logged onto this site through my Google account and I really do not understand how my email address has become my username for this site. I cannot figure out a way of changing it or re-registering it to my real name, which is Robert Dyson. I certainly have no wish to hide it; I had no intention of hiding it; if you can tell me how to make it appear at the top of my posts instead of my email address, I'll effect the change straight away. Despite what you seem to say, I'm sure you don't really mean to imply that anything I said was intended to mock the Church or the Catholic Faith or the Blessed Sacrament. At least, I hope you don't! Yes: "Hoc est enim ****** ****": not (as in the Novus Ordo Missae) "Fructum terrae et operis manuum hominum: ex quo nobis fiet panis vitæ." I am among the many Old Timers - evidently not well represented on this thread - who think that these words are a sop to the Protestant conscience and represent, not exactly a denial, but certainly a fudge of the central truth of faith: that Our Blessed Saviour is Truly, Really and Objectively Present in Body (not as "the bread of life") on the altar as an Eternal Sacrifice. I regret that my old-fashioned 'conservative' - you will perhaps call it reactionary - Catholicism seems to have given offence; but the innuendo that I am some sort of magician is rather a stretch - don't you think? Let us at any rate now go forward in fraternal charity, despite our differences of view. Amen! Yes, let fraternal charity prevail. I appreciate your posted clarifications Dr. Dryson and I apologize to you, again, for offence given and with this conclude posting on this topic. I have now, as you will see, figured out how to post under my real name. Once again, I apologise if my not doing so before gave offence to anyone. Why are so many popes being canonized? Hi Vince, It used to be nuns, then priests and Bishops, then layfolk got a turn, the accent still on the laity, now Popes, showing I guess that the WHOLE Church is holy and heroic. I'm glad it's happening as truly following Christ today, as always, really takes lots of effort. I'm reminded of what a French Cardinal admitted decades ago, "With great ease I am pagan, and with great difficulty a Christian!" How true! By the way, there's one other "recent Pope" awaiting canonization, Pope Pius XII. But I'm afraid until some agreement can be reached with Israel as many Jews continue to view Pope Pius XII as anti-semitic he'll have to wait, but I'm confident that in God's own way and in God's own time it will happen. Most popes in the first 600 years have been canonized. A triple (in a sequence) happened twice in the 7th and once in the 8th and 11th century (counting beatifications). The last double beatified was Gregory X & Innocent V in the 13th (both blesseds). I think Pope Francis will have the record of canonizing popes in a single papacy - 3 in the first six years of his papacy. But, there is more to come. Pius XII is venerable and John Paul I is a Servant of God. Pope Benedict XVI is praised the world over for his humble resignation (I think he is a very holy man). And, if anything happened to Pope Francis, I am sure we would hear calls around the world for santo subito. I rejoice that Oscar Romero is officially joining the ranks of canonized saints and true martyrs for the faith. Paul VI won my sympathy as he shepherded the church through the wilds of the 1960's, the bulk of Vatican II, and the furious controversy over birth control. He deserves sainthood simply for not abandoning this raucous church of ours and heading for a tropical island and a lifetime menu of piña coladas. There is a however, though. I kind of wish our proclivity for ordaining virgins was at least a little tempered by the realization that the majority of souls in heaven likely do not fit that category. I suggest some affirmative action for our moms and dads. The roster of saints should look a little more like the actual heavenly church triumphant. Romero was apparently a good man doing good. I just wish he could be honored without the stain of magic. This continued reliance on 'miracles' just makes the Catholic Church look silly.